Thomas Schuler, a member of the 1980 U.S. Cycling Team, is among 18 American athletes denied the opportunity to compete in the boycotted 1980 Olympic Games in Moscow featured in the book BOYCOTT - Stolen Dreams of the 1980 Moscow Olympic Games. 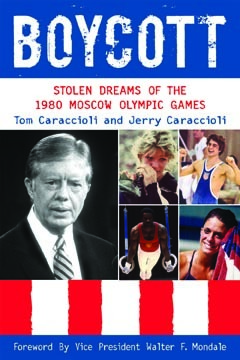 Written by identical twins Tom Caraccioli and Jerry Caraccioli, BOYCOTT: Stolen Dreams of the 1980 Moscow Olympic Games ($25.95, New Chapter Press) chronicles the stories of 1980 Olympic team members who trained thousands of hours for their once-in-a-lifetime chance at Olympic glory in Moscow - only to become pawns in a political Cold War chess match between superpowers. The book also outlines the Soviet invasion of Afghanistan that led to the boycott, efforts by some athletes to overturn to the boycott by legal means and the entire 1980 team's eventual ceremonial gold. Former Vice President Walter F. Mondale wrote the book's foreword. Schuler, a native of Birmingham, Mich., a graduate of the University of Michigan and now a resident of Wauwatosa, Wisc. was an alternate on the 1976 Olympic team, but qualified in 1980, only to have his Olympic experience and opportunity denied by the U.S. boycott. Schuler failed to qualify for the team in 1984. Said Schuler, "There are people like me that only had that one chance.... I was not as adamant then about being denied that opportunity. More so now as I realize the Olympics are a special thing no matter how long a professional career you have. The Olympics are special." Craig Beardsley (Swimming) New York, N.Y.
Sue Walsh (Swimming) Hamburg, N.Y.
Lisa Buese (Swimming) Louisville, Ky. Founded in 1987, New Chapter Press (www.NewChapterMedia.com) is an independent publisher of books that is part of the Independent Publishers Group (IPG). New Chapter Press also published The Roger Federer Story, Quest for Perfection by Rene Stauffer, The Education of a Tennis Player by Rod Laver, The Bud Collins History of Tennis by Bud Collins and The Lennon Prophecy by Joe Niezgoda among others.